After it was nearly shelved entirely, the Fire Emblem series has been fortuitous enough to celebrate a resounding resurgence. When Fire Emblem Awakening had successfully delivered it a second wind, Nintendo responded in kind to task Intelligent Systems with creating Fire Emblem Fates, a three-pronged approach that let players choose to side with Hoshido, Nohr or wander the land alone on a quest for peace. With Fire Emblem Warriors to soon let out a rallying cry and an unnamed entry destined for Nintendo Switch next year, we continue to be kept busy with the strategy series – now presented with the chance to tackle Fire Emblem Echoes: Shadows of Valentia. This Nintendo 3DS exclusive completely reimagines Fire Emblem Gaiden, the second game in the series that never saw release outside Japan – until now, at least. Once again set on a war-torn continent, a divine accord that had long maintained a truce between the two neighbouring kingdoms in Valentia has been broken. It falls to childhood friends Alm and Celica to restore peace to the continent, who, while briefly reunited after being apart for seven years, choose to march their armies to resolve different causes. After being made the leader of the Deliverance, Alm rallies the rebel army as they look to defeat the invading armies of the Rigelian Empire, whereas Celica, believing that her kingdom’s sudden troubles must relate to the earth goddess Mila, sets out to uncover what’s happened in her hope to unify the continent. While Shadows of Valentia‘s protagonists tread two separate paths, the narrative isn’t any less compelling as unexpected events continue to unfold before you. The heroes are accompanied by their own band of companions each packed with personality, and, what will soon readily impress, is that no corners have been cut in localisation. Away from breathtakingly animated cutscenes drawn by Studio Khara, every line of dialogue in the game has been fully voiced with commendable delivery, as Nintendo continue to breathe life into those that inhabit the ravaged lands that you battle across. The camaraderie and relationships that steadily build between your companions have long been part of the experience, and, here, that remains the same. As characters become close, the player will be prompted to position them alongside one another on the battlefield to spark an often light-hearted conversation. These continue to be grid-based skirmishes in which players must use their surrounding terrain to their advantage while exploiting character class weaknesses to topple the enemies that you encounter. The armies that you assemble will have a broad mixture of classes, whether that be Cavalier, Paladin and Sniper to spellcasters such as the Priestess, Mage and Cleric. Each opens their own strategic options to consider, whether that be attacking from afar or shielding weaker allies from harm. It’s certainly important to take care, as players can once again choose between Casual or Classic difficulty settings – your choice determining whether characters are lost forever when they fall in combat. Classic by design, units cannot be paired, using magic will partly consume the caster’s health and your characters equip new weaponry and armour in their single item slot, from which they can learn potent Arts to unleash on their enemies. In many ways, these feel like an effortless throwback to more challenging times but, ultimately, mean that Shadows of Valentia becomes a standout experience for battle-hardened players that have conquered the recent games. Even deciding who will land the deadly blow to fell an enemy is a meaningful decision, with characters reaping experience as a reward more than ever before. Those that are still standing at the end of a battle can receive bonus experience, with more awarded depending on how many enemies they neutralised. This is far from a superficial change, either, with characters unlocking new classes once they have reached a specific level. You must visit a Mila Idol to perform a class change, which is where Shadows of Valentia hurls another curveball in your direction. These are placed within dungeons that are scattered across the expansive world map, 3D spaces in which the camera swoops behind Alm or Celica as you explore their darkened confines. Enemies aimlessly stumble around such caverns and, if you come into contact with them, the action switches back to the standard grid-based battles – opportunities to earn your characters more experience, while uncovering treasure chests that hold mightier weapons for them to wield. However, your army can tire over time, meaning that it will be dangerous for you to endlessly explore such dungeons without recovering your fatigue levels by munching on food supplies or making an offering at a Mila Idol. These 3D dungeon spaces mark a first for the series, and, welcomingly, is an idea that integrates well with the game’s overall flow. The ageing Nintendo 3DS hardware means that the environments aren’t inspired especially, but the freedom of movement and explorative design results in a direction that will captivate with wide-eyed wonder and mystery. How Intelligent Systems have been able to fuse together both old and new is really quite remarkable in execution. Mila’s Turnwheel presents yet another unique concept. This mechanic lets players rewind time, useful to skip back a turn if you make a hasty move and suffer the loss of a character as a consequence. 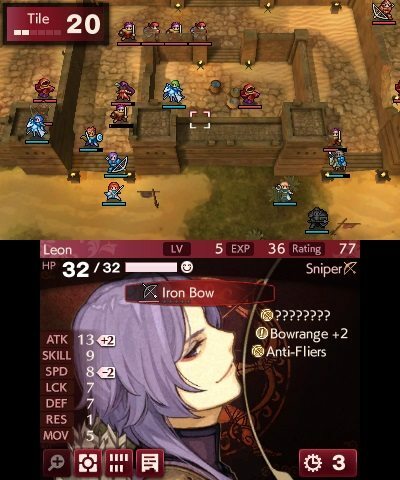 Shadows of Valentia can be brutally challenging in places, and this soon becomes a tremendous help in reacting to unexpected surprises on the battlefield. amiibo support lets you summon illusory heroes to fight alongside you in battle when any Fire Emblem amiibo in the Super Smash Bros. series is scanned, or when any other amiibo is used, a monster ally that that will fight for one turn. 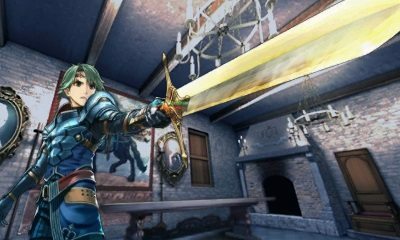 The new Alm and Celica amiibo will unlock a special dungeon, while the characters in-game strength can be saved to the amiibo to have their health later sacrificed to summon an illusory hero to aid you for a single turn. It’s also worth mentioning that Shadows of Valentia has a long road ahead of it, given the extensive downloadable content schedule. After looking to their past, Intelligent System has made a daring strike forward. The result is a resounding strategy experience, with Shadows of Valentia not only delivering a sensational remake but one of the greatest tales that the Fire Emblem series has ever told.